Turbulent skies and humidity as I head into the park this morning. A Sweet Squirrel is forage for it’s breakfast on the Arlington Lawn at the park entrance as I head for the Floral Trail. It appears we are often on the same morning schedule. I love watching it’s graceful leaping and hunting for the hidden treasures in the lawn. When I reach the Trail on the North Mountain side a beautiful Moth lands on a fallen Tree. It’s wings are a grayish brown with light blue plus orange and yellow rings. I cannot remember seeing so many beautiful Moths. I connect with the Lower Dogwood Trail and spot a little shadow moving on the Trail in front of me. Looking closely I see a wonderful spiky black with neon orange caterpillar. I decide to stay and make sure it gets safely across the path. I believe it letting Nature take it’s course, my purpose was not to save it from predators, it is to make sure a jogger does not mindlessly crush it under foot. From the Lower Dogwood I hike up to the Upper Dogwood Trail, and catch a young couple making out 🙂 Note to couple the morning is often a busy time on the trails and in the middle of the path not a good plan LOL. After managing to stifle my laughter I continued along the trail. Near the trail head I hear a rustling to my side, I turn to look and see a Male Box Turtle. His coloring is fantastic a rust head an black front legs with yellow spots. In an effort to learn why I rarely see them I decide to stand and watch it’s progress up the side of the bank. To my surprise it climbs up to the leaves and burrows halfway into them, when finished at first glance it appears to be just another rock. I hike down North Mountain to the Hot Springs Mountain Trail and head over to Hot Springs Mountain. Along the trail I can hear beautiful bird call, as I am listening I spot a wonderful patch of pink Wild Roses blooming on the trail edge. As I am admiring the beauty of the Rose I hear a Male Cardinal in the Tree above me. I turn to see two bright red birds flitting around the leaves. 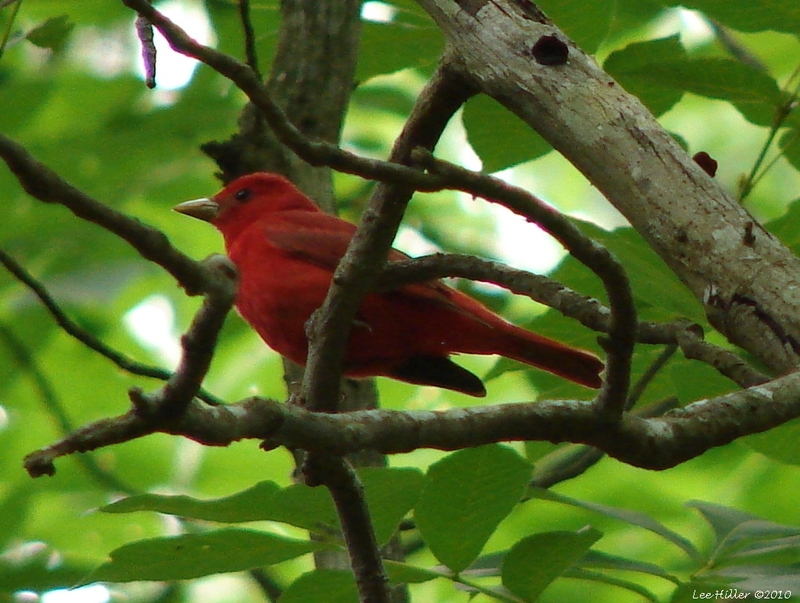 It is not until I return home I discover only one of the birds is a male Cardinal, the other is a Summer Tanager. This is my first sighting of a Tanager in the park. From the Hot Springs Mountain Trail I connect with the Honeysuckle and then the Floral Trails. Half way down the trail I spot a little Chipmunk peeking out from under a log. I stand silently and watch as it comes out looks around, climbs up the log, stops to look at me for awhile then vanishes over the other side. It is the first time I have seen a Chipmunk using it’s tail for balance, it reminds me of a miniature fox. Nature is a beautiful teacher. When I reach the bottom of the trail I head to the park entrance. At the entrance Magnolias are opening in greater numbers, the white blossom fill the air with a glorious sweet scent. It is the perfect way to finish my morning in the park. Be prepared to see what Nature has to show you! I head to the Floral Trail this morning and as I enter the park a Chipmunk is sitting in front of me. I keep walking forward and when I reach the sweet Chipmunk it sits eating it’s newly found seed occasionally looking up at me. It dives in a hole grabbing another seed, pops back out and continues looking at me but not running away. I enter the park with a smile on my face, I Love Chipmunks… I Love Nature! The Floral Trail is peaceful and I can almost see the vines growing and the leaves unfurling. 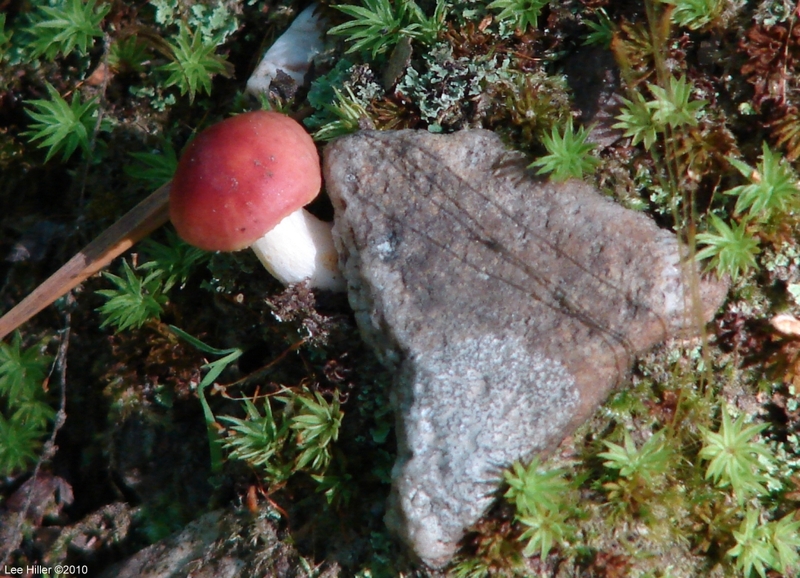 Nestled in the Soil and Moss is a tiny little red and white Fungus. It is the first of this color I have seen in the Forest, I don’t want it to be the last. I head up to the Lower Dogwood Trail and a black Butterfly lands on the trail ahead of me. It sits pumping it’s wings flashing the bright color detail on the underside. The backside of the Lower Dogwood Trail is green tranquility, each step forward a divine awakening. All around me tiny creatures are foraging and above birds are singing. The solitude is bliss, I stop for a moment, close my eyes and breathe in the the beauty. I scan the lower branches for green Tree snakes and lizards. They are a lovely bright green like the new leaves, I have many months to search before they leave the Forest again. I see a beautiful Orange autumn leaf shaped Butterfly on the side of a Tree. 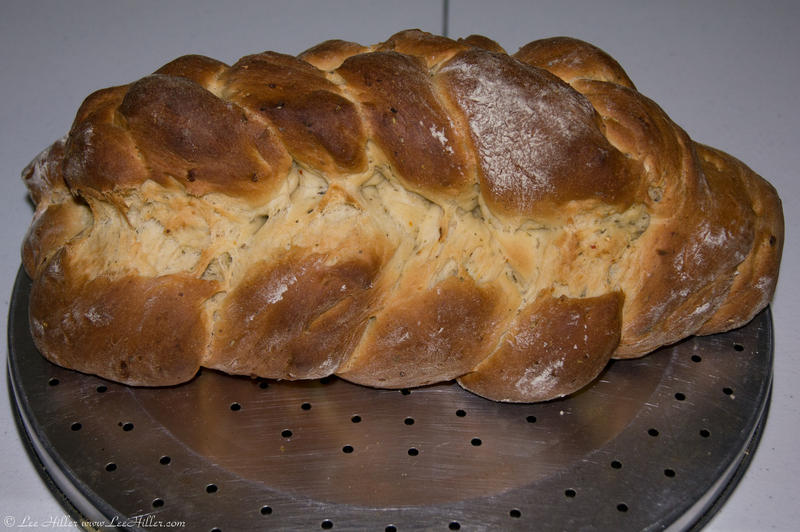 It looks spectacular with the bright sunlight shining on it’s wings. From the Lower Dogwood I connect with the Upper Dogwood then on to the Hot Springs Mountain trail. From there I take the Hot Springs Mountain Road and I can see delicate and seemingly invasive Japanese Honeysuckle winding it’s way along the edges of the Forest. At the Park’s main entrance the Magnolia Trees are preparing to burst forth with fragrant blooms that will stretch the entire length of the Historic District. Thank you for joining me for my hike in the Mountains, I always enjoy your cpmpany. I left a bit later this morning and the Lower Park at the Arlington Lawn was empty of people but is alive with Nature. 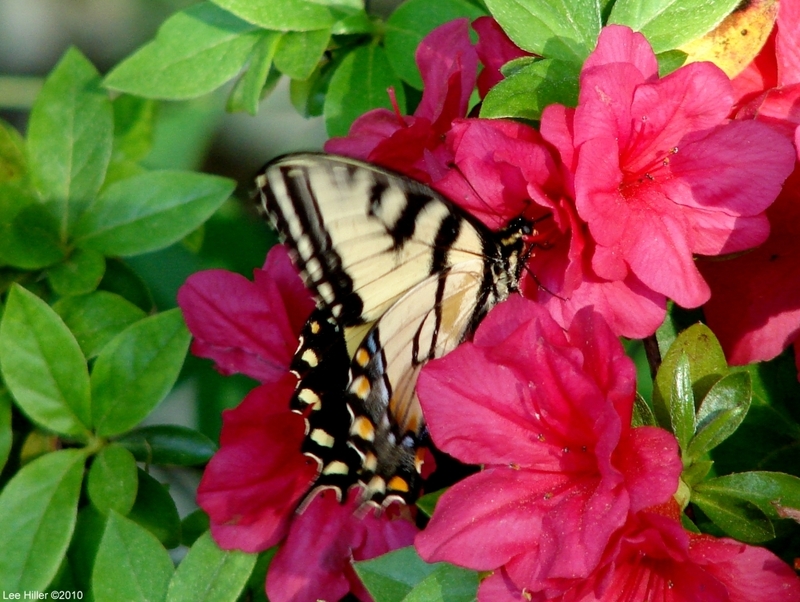 A beautiful Yellow Swallowtail Butterfly dances gracefully over the Fuchsia Azaleas. Occasionally is dips into the bell of a bloom seeking out the sweet nectar in the center. A lovely Squirrel is searching the lawn for a well deserved breakfast, I Love joy with which it relishes its prize. I head up to the promenade on my way to the Peak Trail and spot a sweet Chipmunk filling it’s cheeks with tender seeds. A black and blue Butterfly brushes past me and lands near the Hot Spring Cascade. As I lean over for a closer look I see a lovely Chipmunk sitting on a Rock above the steam. Nature is glorious and her beauty is flowing all around me in the park this morning. From the Promenade I connect to the Tufa Terrace and then the Peak Trail. The Forest embraces all who enter now, its canopy spreading out over the many trails. As I hike up the Peak Trail I spot a lovely Chipmunk staring at me from the top of an old stump. The morning sun is shining gentle illuminating it from behind. When I reach the top of the Peak Trail I notice the Shooting Star Wildflowers are now tiny fluffy seed balls. Their beauty was fleeting and I am so happy I was able to see their short lived blossoms. I connect with the Hot Springs Mountain Trail then hike over to the Upper Dogwood and Lower Dogwood Trails to reach the Floral Trail. Phlox appears in many beautiful colors all along the trails as I head to the park entrance. A melodic Northern Mockingbird serenades me as I complete the last bend on the Floral Trail. When I reach Arlington Lawn I look up and see the birth of a Magnolia Blossom in one of the large Trees that line both Fountain Street and Central Avenue with in the park. It is a long awaited event as the Magnolia perfume will fill the Historic District. The morning has been a blessing of life in the park.